Dorothea Lynde Dix (April 4, 1802 – July 17, 1887) was an activist on behalf of the indigent insane. She created the first generation of American mental asylums, now called mental hospitals, through her vigorous program of lobbying state legislatures and the United States Congress. She traveled the world, and her work changed the way we treat the mentally ill. She had a long and varied career, as an author of children's books, starting schools, and creating a volunteer female nursing corps, all in addition to her main calling—as advocate for better treatment for the mentally ill. Her efforts revolutionized society's attitude toward such suffering people, giving them a place in the family of humankind. Dorothea Lynde Dix was born in the tiny frontier village of Hampden, Maine, on April 4, 1802, to a family in constant distress. Somehow, from there she managed to become a woman whose epitaph read that the United States had not produced a more productive or useful woman. Her father, Joseph Dix, was an itinerant Methodist preacher who was an alcoholic. Her mother, Mary Bigeloe Dix, was four years her father's senior and constantly had headaches, literally and figuratively, struggling with depression and the family's lack of finances. Dorothea took care of the other children. Dorothea was forced to stitch words on religious tracts for her father to sell. She never liked to talk about her childhood, and even said that she never had a childhood. She did, however, learn to read and write from her father, and subsequently taught her siblings to read and write. When she was twelve, the fighting between her parents became too much, and she went to her paternal grandmother's house in Worcester, Massachusetts. She had been named after her grandmother, and had always loved her grandfather, Dr. Elijah Dix. She especially loved reading his books from when he was a student at Harvard University. Her grandmother wanted her to become a lady, and as she was rich, she paid for Dorothea to have tennis lessons, a seamstress to make her clothes, and everything a young society lady would want. She was very upset when Dorothea gave away those clothes to the poor who stood outside the gate. After a few years, Dorothea went to her aunt, as her grandmother felt she could help Dorothea more. Dorothea wanted to return and help her siblings, but it was four more years before she could do so. At one of the society events, Dorothea met Edward Bangs, her second cousin. He was fourteen years her senior, and an attorney. He helped her start a school in a small shop on the main street, as he appreciated her knowledge and desire to help others. At the age of fifteen, she taught twenty pupils aged six to eight, and her school was quite successful. She ran this school for three years, with much support from Bangs, for which she was very grateful. Meanwhile, Bangs grew quite fond of her, and eventually proposed. She was afraid to accept, fearing a marriage like her parents. She closed the school and returned to her grandmother's house. Bangs pursued her, and she finally agreed to marry him but would not set a date. Eventually, she realized her school was more important to her, and returned his ring. Dix was not religiously satisfied by the Methodism of her father, and by the early 1820s had found her religious home among Unitarians. She appreciated the Unitarian emphasis on the goodness of God, purity of heart, openness to new knowledge, and responsibility for the good of all society. She became a close friend of William Ellery Channing, the famous pastor of the Federal Street Church in Boston. She acted as governess to his family upon occasion, traveling with the family on vacations. During this time, she read many printed Unitarian sermons appreciatively and critically. In the 1830s she had a physical breakdown, probably suffering from tuberculosis. The treatment for this was not well known at the time. In hopes of a cure, in 1836 she traveled to England, where she had a letter of introduction from Channing, and stayed with the Rathbone family for a year at Greenbank, their ancestral mansion in Liverpool. The Rathbones were Quakers and prominent social reformers. At Greenbank, Dix met men and women who believed that government should play a direct, active role in social welfare. She was also exposed to the British lunacy reform movement, whose methods involved detailed investigations of madhouses and asylums, the results of which were published in reports to the House of Commons. She returned to the United States in 1941. On March 28, 1841, Dix went to the East Cambridge jail to teach a Sunday School class for women. She was shocked by what she saw. The mentally ill, the criminals, and the debt-ridden were all together in an unheated place, with a stone floor for their bed. One man was naked, chained and whipped to make him to behave better. She was told that the insane do not feel things like heat or cold. She could not tolerate this. From that point on, this was Dix's calling. She began to prepare herself for her new mission—to create decent conditions for the mentally ill. She read extensively and interviewed physicians about the diagnosis and treatment of mental illness. She acquainted herself with the work of reformers Philipe Pinel, Benjamin Rush and William Tuke. She became as educated as anyone of the day about the various aspects of mental illness. Dix conducted a thorough statewide investigation of how her home state of Massachusetts cared for the insane poor. She toured many facilities in Massachusetts and started to document their conditions of incarceration. Her society years had helped her gain many admiring friends with great influence, Bangs among them, who helped her win time lobbying legislature and gaining further contacts. She published the results in a fiery pamphlet, a Memorial, to the state legislature. I proceed, Gentlemen, briefly to call your attention to the present state of Insane Persons confined within this Commonwealth, in cages, stalls, pens! Chained, naked, beaten with rods, and lashed into obedience. The outcome of her lobbying was a bill to create, expand, and develop state mental hospitals. Dix then traveled from New Hampshire to Louisiana, documenting the condition of pauper lunatics, publishing memorials to state legislatures, and devoting enormous personal energy to working with committees to draft the appropriations bills needed to build asylums. Dix's views about the treatment of the mentally ill were radical for her time. It was commonly believed that the insane could never be cured, and it was sufficient to provide minimal care for them. Dix could see that simply bettering the conditions of the inmates helped them. One example she gave involved young woman who was for years a "raging maniac," chained in a cage, and whipped to control her acts and words. She slowly recovered her senses simply by the kind treatment of a couple who had agreed to take care of her in their home. Dix visited every state east of the Mississippi River, which was most of the United States at that time. Her process was always the same. She first made careful documentation of the conditions in the various institutions, and then prepared a document to report these to the State Legislature. Her first "child" was the New Jersey State Hospital in Trenton, New Jersey. This was the first to be set up with state funds, thus establishing that social service was within the scope of government. She was instrumental in the founding of the first public mental hospital in Pennsylvania, the Harrisburg State Hospital, and later in establishing its library and reading room in 1853. Many other states followed suit, and the word began to spread how many former inmates could improve. In the twentieth century, some unjustly blamed Dix for custodialism in the hospitals she had helped found. Her writings are clear on how she hated custodialism, believing that those suffering mental illness should be encouraged to take as much responsibility in their daily life as possible. She argued strongly that the mentally ill should be provided therapy, books, music, recreation, and, above all, meaningful work. She embraced a holistic approach to care and treatment. Her dream was that legislation be enacted to set aside federal land to be sold, with proceeds from its sale distributed to the states to build and maintain asylums. Dix's land bill passed both houses, but in 1854 President Franklin Pierce vetoed it, arguing that the federal government should not involve itself in social welfare. Stung by the defeat of her land bill, in 1854-55 Dix traveled to England and Europe, where she reconnected with the Rathbones and conducted investigations of Scotland's madhouses. Her work precipitated the Scottish Lunacy Commission. Throughout the 1850s she carried on her work in the British Isles, France, Greece, Russia, Canada, and Japan with hospitals for the mentally ill being established in those locations. During the Civil War, at fifty-nine years old, Dix volunteered for service in the Army for the Union. She was appointed Superintendent of Army Nurses. She worked tirelessly throughout the war without pay to benefit the conditions of both the nurses and patients. She battled many prejudices and effectively promoted the use of female nurses. As supervisor to 3,000 nurses, she insisted that they be respected by the officials and patients, and that they not be distracted by the men. To this end, she allowed only less attractive women over thirty to serve. She also ordered court-martialled every doctor she found drunk or disorderly. Her volunteer corps were wildly popular and readily accepted by civilian authorities, although scorned by the army. She would often bring in supplies from private sources when there were not enough rations, medicines, and supplies from the military. However, she was not prepared for the bureaucracy of the army, and her administration skills were not the best, and finally she left her position. Nevertheless, the nursing corps was undoubtedly better due to her efforts. As a teacher, she wrote many books and had success helping parents learn to work with their own children. Conversations on Common Things, published in 1824 and much reprinted, helped parents appreciate and answer their children's questions such as: "Why do we call this day Monday? Why do we call this month January? What is tin? Does cinnamon grow on trees?" The answers given demonstrated Dix's extensive knowledge of the natural world and understanding of children and teaching. Dix fought ill-health all her life, yet was probably the greatest humanitarian in nineteenth-century America. She was instrumental in founding 32 mental hospitals, 15 schools for the feeble minded, a school for the blind, and numerous training facilities for nurses. Her efforts were an indirect inspiration for the building of many additional institutions for the mentally ill. She also helped establish libraries in prisons, mental hospitals and other institutions. When Dorothea Dix was 73, she watched the first class of nurses especially trained to care for the insane graduate from "her" hospital, the New Jersey State Hospital at Trenton New Jersey. She spent her last years living in a private apartment there, writing letters from her bed defending those who could not defend themselves. She died in 1887, and was buried in Mount Auburn Cemetery in Cambridge, Massachusetts. Her epitaph read, "She was the most useful and distinguished woman America has yet produced." 1824. Conversations on Common Things. Munroe and Francis. 1828. Meditations for Private Hours. L.B. Weston. 1829. The Garland of Flora. 1832. American Moral Tales for Young Persons. The primary archival repository for Dix's unpublished works, including her letters, is in the Houghton Library at Harvard University in Cambridge, Massachusetts. ↑ Historic Asylums article on Harrisburg State Hospital The Dorothea Dix Museum and Library founded in 1853 is located at the Harrisburg State Hospital. Retrieved March 2, 2008. Bumb, Jenn. 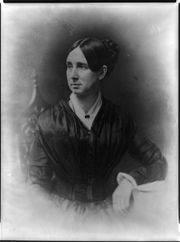 "Dorothea Dix" Women's Intellectual Contributions to the Study of Mind and Society. Retrieved March 2, 2008. Gollaher, David. Voice for the Mad: The Life of Dorothea Dix. The Free Press, 1995. This page was last modified on 11 October 2017, at 20:06.